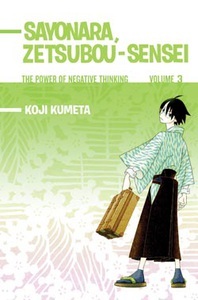 One of Zetsubou-sensei's new students - a genius storyteller - can melt even her teacher's black heart. Meanwhile, Chiri, the obsessive-compulsive girl who longs to marry Zetsubou-sensei, is thrilled when the morose young man actually invites her somewhere. Has Zetsubou-sensei asked Chiri out on a date, or is he planning a murder-suicide? Either option may involve flowers!